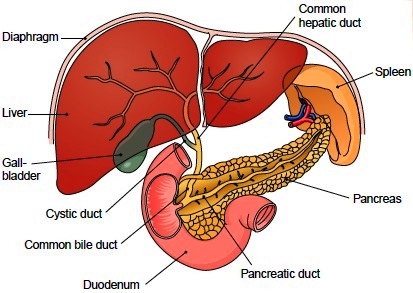 Cholangitis refers to an inflammation and / or infection of the hepatic and common bile ducts associated with obstruction of the common bile duct. Pain, chills, and jaundice (Charcot triad) are the cardinal symptoms of cholangitis. Pain may be absent. Bacterial cholangitis especially in patients with extrahepatic bile duct obstruction by gallstones or strictures, is less frequent in tumor obstruction. Parasites rarely cause cholangitis. Laboratory findings indicate cholestasis and a bacterial infection. Transaminase levels are only moderately raised. The liver is enlarged and painful upon palpation. Cholangitis resolves within a few days after antibiotic therapy, but recurs if the cause of the obstruction is not eliminated. Complications of cholangitis are liver abscess formation, sepsis, and secondary biliary cirrhosis in patients with a chronic clinical course. • Broad-spectrum antibiotics directed at gram-negative enteric organisms, anaerobes, and enterococcus: if infection is nosocomial, post-ERCP, or the patient is in shock, strong consideration of broader coverage to include hospital organisms such as Pseudomonas aeruginosa, resistant Staphylococcus aureus, and others. Repeated decompression may be necessary, particularly when obstruction is related to neoplasm. Excellent prognosis if obstruction is amenable to definitive surgical therapy; otherwise relapses are common.